Pinkie Pie happily hummed to herself as she bounced through the streets of Ponyville. And all things considered, how could she not be happy? She had a job she absolutely loved, a town she absolutely loved, and, best of all, five friends she absolutely loved! Why, they were the best friends a pony could ever have! Ever! And of course, if things ever did get a little boring, all she had to do was throw a party and everything would be better! Her life was perfect! Speaking of her friends, Rainbow Dash dashed over (Dash dashed! Ha!) when Pinkie was just rolling in the grass for fun and told her that she and the other girls wanted to talk to her about something. And when Pinkie Pie asked about what, Dash just told her that it would be best to wait until she got there. Ooh, what were they going to talk about? She didn’t know, so that meant it was a surprise! And Pinkie Pie just loved surprises! Could it be a *gasp* surprise party too?!? Seeing the library that Twilight lived and studied in, Pinkie Pie opened the door and greeted then in a sing-song voice. “Heeeellllloooo everypony!” This was when she would expect her friends to laugh, giggle, roll their eyes, or just say hello back. Instead, when Pinkie Pie opened her eyes, she saw that her friends all worn deadpan expressions; well, except Fluttershy, who was just frowning while looking scared. Was something wrong? 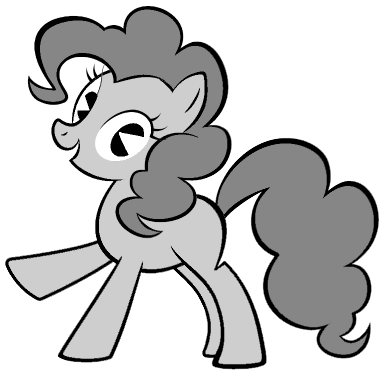 “Okay!” Pinkie Pie said after she shut the door and while she was trotting over to the table. She expected a lot more smiles but… everypony looked so serious. Was something the matter? And how many cupcakes did she needed to make to fix it? “Pinkie Pie, Partner, thar’s somethin’ we need tah talk about here.” Applejack began. “What do you mean?” Pinkie Pie asked, tilting her head to the other side a little further than the first turn was. “I don’t know whatever you could mean,” Pinkie Pie said, titling her head back the other way… in a 360 spin, somehow not snapping her neck. This cause the others to wince, while Rarity desperately tried not to faint from shock and Rainbow Dash got angry and slammed two hooves on the table. Pinkie Pie looked at her friends, stunned. Is that what this was all about? Oh, she had gotten careless the last year or so, hadn’t she? She sighed and then got a very serious, grim look on her face. Pinkie Pie sighed and stood up, pacing as she tried to think of the best way to explain this. The group looked at each other uncertainly before Twilight smiled nervously. “I’m serious!” Pinkie Pie said, a lot more stern than most ponies were used to seeing her. Pinkie Pie nodded before walking back to the table. “…a what now?” Applejack asked. For some reason Pinkie Pie was facing in a different direction, as if she was talking to somepony else that wasn’t even there. “Pinkie Pie…what are you talking about?” Twilight asked, just as confused as the rest of the ponies. With that, Pinkie Pie walked behind the door to Twilight’s basement and, not more than five seconds after she closed the door, she already trotted back in with a bounded stack of papers and only one pencil. “She’s doing it again...” Rainbow Dash grumbled through gritted teeth. At that she let the pages flip as an image of Pinkie Pie bounced through a meadow before she stopped and greeted five other ponies that happened to be her friends. The last few pages ended with the six friends laughing together. “It has everything to do with anything!” Pinkie Pie said seriously before her face soften. “Uh, I mean… everything with everything. I think. Oh, right, what it has to do with anything! The group looked over at Pinkie Pie with shock and disbelief. Was she saying that she started out like that stack papers? How was that possible? Pinkie Pie noticed the looks of disbelief on their faces. At that Pinkie Pie began to mess around with the inside of her mane. The group looked at the photo with what could only be described as open-mouthed gapes. “Why, that’s me, of course! Waaaaaay back in the day!” Pinkie Pie explained, as if this was the most normal thing in the world. “Why is the photo in black and white?” Twilight asked, raising an eyebrow. “Where on earth is your cutie mark?” Rarity asked. “….Pinkie Pie isn’t even your real name, is it?” Twilight asked, not sure if Pinkie Pie was even telling the truth anymore or not. And her friends thought that the name “Pinkie Pie” was rather on the nose. “Party Pony?” Twilight wearily asked, raising an eyebrow. “Pinkie Pie?” Twilight asked, sensing some serious dread coming from her friend. “Well… see, before and after they drew me, they did a bunch of black and white cartoons. That meant the world I came from was in black and white too. I know it sounds strange but you get used to it after awhile… well, then again, it was all I knew for a long time, so I guess I was already used to it! “But then all of a sudden-BAM!- the whole world turns into color but I’m still grey and everything! It was scary at first but colors are just sooo pretty, especially the first time I saw a real rainbow! They pretty much forgot about me and no matter how much I tried, when the cartoons played, I was always sealed off from where ever the cartoon was taking place at. “Well…it took a long time but eventually things just kept changing and changing. At first it was just little things, things you don’t notice right away. But then cartoon characters started to look and act differently than before and the changes kept piling on up, so much so that Bugs Bunny was no longer buggy and Daffy Duck wasn’t daffy anymore! Which was a shame because they were a lot more fun to party with when they were! Pinkie Pie found herself standing on the table on her hind legs, pretending to hold a sword; she really missed when she could just hold things with one hoof even though she didn’t have fingers; that was one thing she missed from the old days. When she saw her friends weren’t the least bit amused, she smiled, laughed nervously, and sat back down. “So…yeah, I got used to it eventually and for a long time the changes mostly stopped! But eventually the changes did come back and it was getting too scary for me…scary and stupid. I mean, ugh, Space Jam, heeeellllooo! That movie was terrible! And don’t get me started on Baby Loony Tunes! Whose bright idea was it to turn everybody into babies?!? You can’t party with babies! I didn’t mind the Duck Dodgers one too much I guessed but things were getting a lot more dangerous for good ol’ Party Pony. “….something called Loonatics Unleashed. And it changed everything. I just don’t mean the genre or the setting or a few characters, I mean everything. The fellow cartoon characters I used to call my friends were just no longer the same, even more so than usual! It was like some kind of bad parody, but actually produced by a studio, so it had real power over my world! I mean, I guess some people liked it and good for them but here was poor old Party Pony, a black and white cartoon character made during the Golden Age of Animation lost in some darkly colored, post-modern, super hero comic book inspired setting with super heroes and villains and super powers and…I was so scared that I could actually get hurt for real! “And I…I just couldn’t take it anymore! I needed a place that stayed the same, where the people I knew wouldn’t just have their personality completely change from one cartoon to the next! Where I didn’t have to worry about going to bed one night and then waking up on a ship or another planet or something! “It’s a term the people who created me have to describe most cartoon characters. Most cartoon characters don’t know they’re in a cartoon; they can’t see the strings that control them, so they’re said to have a fourth wall between them and the people who watch the cartoons. “But sometimes some cartoon characters know they’re in a cartoon and I was one of them, so it’s called ‘breaking the fourth wall’. Only not really, because it’s still just cartoon characters still in their little cartoon world. But I found a way to break the real fourth wall and left the whole dimension completely. I didn’t care where I turned up, I just wanted some place where I could belong! “Then, after falling through black emptiness for what felt like forever, I suddenly appeared inside the Sugarcube Corner when they were renovating! Oh, the Cakes were so scared, especially since I at first still looked like my old self! But somehow…well, I’m not sure myself how it worked, but I think your world started to change me and then I looked like this! I was still me on the inside and was still the same pony but now I was in color and had new eyes and even got my cutie mark! And the Cakes, bless their hearts, they were really scared of me at first but they listened to my story and they felt so bad for me that they were willing to take me in! The entire group simply stared at Pinky Pie, trying to process everything they just heard. It was then that Fluttershy, who had been quiet the entire time, finally spoke up. “What do you mean ‘when it’s funny’?” Twilight asked; this was the first time Pinkie Pie mentioned anything about rules. “You’re over 75 years old?!? Twilight practically shouted, while everyone had various reactions of shock and disbelief. “But…you’re not...you still look…how can you be...” Twilight stuttered, trying and failing to come up with a complete sentence. “Why don’t ya have more wrinkles than Granny Smith?! ?” Applejack suddenly interrupted. “Thank you, Applejack.” Twilight smiled. It was then that Pinkie Pie gave everypony a very serious, sad look, the kind that spoke of somepony who had seen many things she didn’t want to talk about. “It may not be but it’s true!” Pinkie Pie said, somehow placing the photo back inside her mane, even when it was obvious that it shouldn’t fit in there. “Hammerspace.” Pinkie Pie responded, as if this made perfect sense. Rainbow Dash gave up, probably either not going to get a better answer or, worse, not liking the answer. That’s when Pinkie Pie suddenly looked so sad, that not only were her eyes watering but her hair went straight again and her colors dulled; it was the same thing that happened when she thought nopony wanted to be her friend. Pinkie Pie suddenly regained her color, hair style, and cheerful disposition again, nodding vigorously. The gang simply laughed for a bit and then they talked a bit more about what Pinkie Pie’s old life was like and whatever knowledge her ability to break the fourth wall gave her, like what humans were like, what other kinds of cartoons they made, and other such stuff for the next several hours. As they went their separate ways, Pinkie Pie bounced her way back home to the Sugarcube Corner, being sure to remember her promise to her friends about when she used her natural born abilities. She wasn’t sure what the future would be like and how it would affect her but she did knew one thing: she really did have the best friends a pony could ever have. Ever.